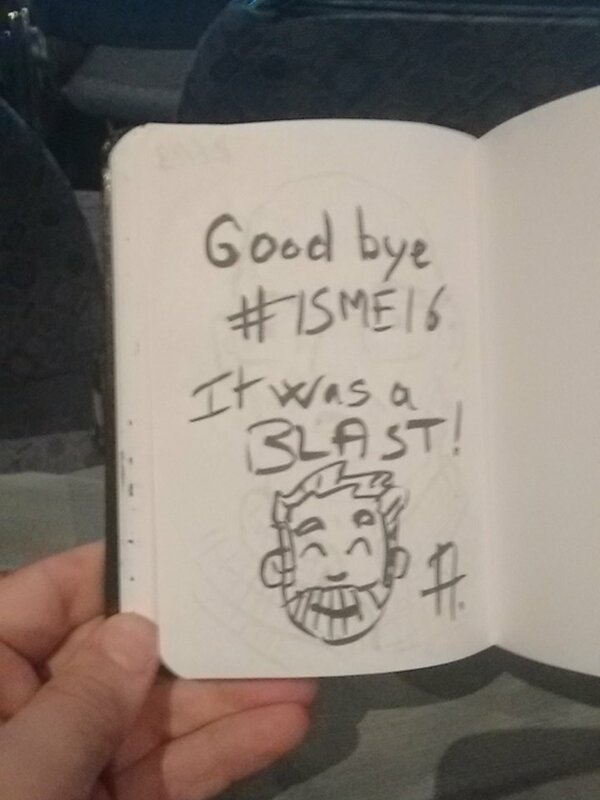 French microbiologist Adrien Assié sketched his way through ISME16, and departed on Friday with this tweeted sentiment. All good things must come to an end, even the 16th international symposium hosted by the International Society for Microbial Ecology (ISME) from Aug. 22-26 in Montreal. Society president Janet K. Jansson joined 14 other PNNL researchers at the signature event, held every two years. With the vast Palais des congrès de Montréal as a venue, the conference celebrated professional exchange and education with over 300 presentations, 800 posters, and more than 2,100 attendees from around the world. It was the largest symposium in the society's 40-year history. By the end, there were some strong reactions. "ISME16 was without a doubt the most epic thing ever," wrote Biological Sciences Division post-doc Richard A. White III in an email. "No other conference is even in the same ballpark. Or will even be close to it - WOW!" A prolific author already, he works with Jansson on advances in analyzing soil microbiomes. Over the five days of ISME16, a garden of tweets grew up and flourished on the internet. After one particularly lively session, one researcher tweeted, "Mind = Blown (for the 100th time this week)." Mary S. Lipton, a senior staff scientist at PNNL, had a role in the mind-blowing magic. On Friday (Aug. 26), the conference's last day, she took to the podium with "Deciphering microbial community interactions through succession," which acknowledges 17 PNNL co-authors. The talk confronted a stubborn fact: Microbial communities, and the autotroph-heterotroph interactions they rely on, influence biogeochemical cycles on a global scale. But the molecular mechanisms behind these interactions are largely unknown. After all, highly diverse and complex natural systems are very difficult to control in laboratory settings. To elucidate the principles governing these natural systems, researchers need them to be "tractable" - that is, easy to control. To address that challenge, Lipton explained, the PNNL researchers developed an experimental platform that simplifies manipulation and observation. This model consortium of autotrophic and heterotrophic microorganisms experiences metabolic shifts over a 28-day succession cycle. In seven-day intervals, researchers recorded the consortium's patterns of organism abundance and protein expression. Next, she said, the researchers will use metabolic models of other consortia to infer "interaction maps." On the PNNL campus, Lipton is the capability lead for mass spectrometry at the Environmental Molecular Sciences Laboratory (EMSL). So a plug was in order for the specialized capabilities at this national scientific user facility. One of her slides listed 23 EMSL instruments, specialties, and other attractions, from confocal microscopy and cell isolation systems analysis to microfabrication fluidics. Lipton was in good company among those making Friday presentations. Other researchers touched on cellulose degradation in landfills, cow-gut resistance to antibiotics, iron cycling in lake snow, fungal gardens, plant-microbe interactions, leaf bacterial diversity, fleshy algae in coral reefs, microbial carbon capture systems, and the bounteous life of microbes in Antarctica's frigid, hypersaline Lake Vida. University of Colorado evolutionary biologist Noah Fierer packed the house with a talk on how perturbed soils survive. Steven Biller, a research scientist in the Chisholm lab at the Massachusetts Institute of Technology, spoke about extracellular vesicle production in marine bacteria. And microbiologist Adrien Assié (@m3thyl) dove into his cool ocean research into epibionts that live on the surface of a genus of deep-sea mussels called Bathymodiolus. It was Assié who also sketched his way through the conference, then broadcast his quick portraits of presenters via Twitter. "Fantastic meeting!" tweeted PNNL's Vanessa Bailey, crediting Jansson and her ISME16 team. She used another tweet to comment on a sketch by Assié, who trained in France and works in Germany. At the conference, a long line of posters listed attendees by country. "At any given time," said White, the PNNL post-doc, "I was talking with a group of scientists from five different continents." Friday afternoon presentations by two keynoters drew big crowds. Molecular biologist Siv Andersson of Uppsala University in Sweden, who studies how intracellular bacteria and organelles evolve, delivered a plenary talk on bacterial symbionts, including an explanation of why mitochondria contain a genome. McMaster University health science researcher Gerard D. "Gerry" Wright told the science story of antibiotic resistance. To microbes, he observed, antibiotics are more weapons than anything else. Heavy stuff. But more than one tweet busted the many scientists who used Montreal and ISME16 to play the mobile game Pokémon Go. Someone else took the time to invent a 16-square "ISME Bingo." Among the choices: "n=1," "acronym for new tool," and "mockery from outside fields (e.g., physics)." At day's end, Jansson gave out poster awards, with James Blunt's "You're Beautiful" as a soundtrack. She also handed over the ISME reins to incoming president Colin Murrell, a British environmental microbiologist who teaches at the University of East Anglia. "There is one person we really need to thank - Janet Jansson," he told her on stage. "We've been extremely fortunate to have your guidance." ISME17 will be held in August of 2018 in Leipzig, Germany. And in 2020, ISME18 - "Brilliant!" one tweeter crowed - will be in Cape Town, South Africa. By Friday evening the ISME16 Twittersphere had quieted. But one researcher tweeted that he would remember the symposium this way: "peeking in on all the cool stuff."